Grave : Plot III. Row B. Grave 57. F.G. Aplin was a son of Fred Aplin, of Regent's Road, Bedminster, Bristol. He was born on 14 November 1888. married to Gertrude Cockle (formerly Aplin), of 51, Somerset Street, Cathay, Bristol, England. Before he enlisted into the Army he was a farmer. He also had prior service with the Somerset Light Infantry. 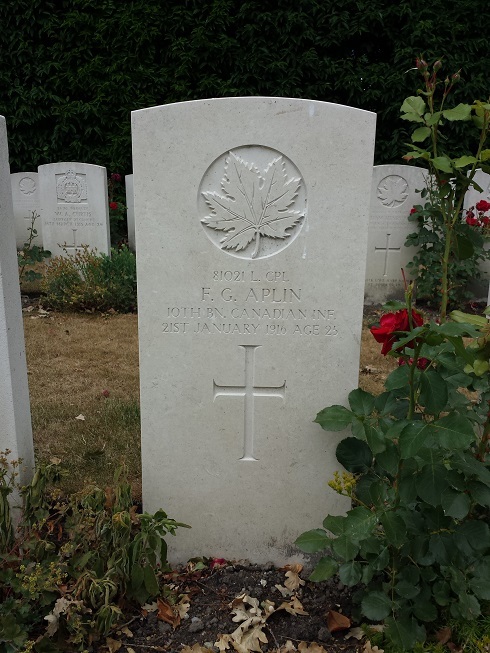 Aplin enlisted into the Army on 14 December 1914 in Winnipeg, Manitoba, Canada. He served as a Private with 32nd Battalion Canadian Infantry before he transferred to the 10th Battalion.